2,4G Wireless technology provides cable-free for your desktop with a stable connection. The keyboard and mouse share one receiver which is inserted in the slot underneath the mouse. Just plug it into an USB port and you're ready to go. RELIABLE 2.4GHz WIRELESS CONNECTION: 10m or 33 feet range. One USB receiver for both keyboard and mouse, more stable and quick connection for your computer without delays when you're typing. 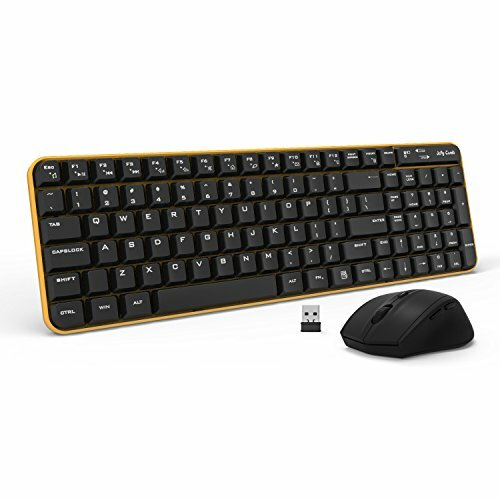 COMPACT DESIGN 25% Smaller: The keyboard is 25% smaller than a full-size keyboard but provides all the functionality of its larger counterpart. Meets all your needs for work and daily life. ADJUSTABLE 3 DPI SWITCH: The mouse has adjustable switch with 3 DPI levels on the top. Easily adjust the sensitivity of the mouse between 3 DPI levels (800/1200/1600) to suit both ordinary and gaming needs. Optical laser allows for quick response, precise movement, and smoother tracking. COMPATIBILITY: Compatible with Windows XP, Vista, Win 7, Win 8, and Win 10. NOTE: wireless receiver is stored in the receiver slot at the bottom of the mouse; 2 AA batteries required but NOT included. View More In Keyboard & Mouse Combos. If you have any questions about this product by Jelly Comb, contact us by completing and submitting the form below. If you are looking for a specif part number, please include it with your message.